NASA's Cassini spacecraft snapped this angled shot of Saturn, showing the southern reaches of the planet with the rings on a dramatic diagonal. Saturn's icy moon Enceladus is visible as a tiny white speck in the lower lefthand corner. The picture was taken on June 15, 2012, at a distance of about 1.8 million miles. Saturn's southern reaches are draped in the shadow of the huge planet's iconic ring system in a spectacular new picture from NASA's Cassini spacecraft. 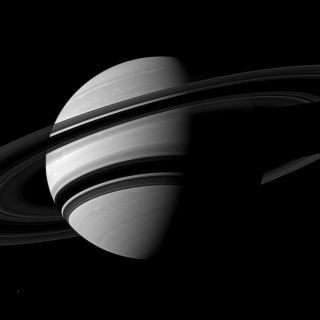 The near-infrared photo, which Cassini snapped on June 15, looks toward the southern, unlit side of Saturn's rings from 14 degrees below the ringplane, researchers said. The spacecraft was about 1.8 million miles (2.9 million kilometers) from Saturn at the time; the image scale is 11 miles (17 km) per pixel. Saturn's ice-covered moon Enceladus, which is 313 miles (504 km) wide, is visible as a tiny, bright speck in the lower lefthand corner of the image. Many researchers regard Enceladus as one of the best bets in our solar system to host life beyond Earth. Though surface temperatures on the moon are frigid, Enceladus is believed to harbor a vast ocean of liquid water beneath its icy shell. Enceladus also boasts huge amounts of internal heat, which power a system of geysers that erupt from the moon's south polar regions. Cassini discovered these geysers in 2005 and has snapped many photos of them since. The $3.2 billion Cassini mission is a collaboration involving NASA, the European Space Agency and the Italian Space Agency. The spacecraft launched in 1997 and arrived at Saturn in 2004. It has been studying the ringed planet and its many moons ever since, and should continue to do so for years to come; the Cassini mission has been extended to at least 2017. In early 2005, Cassini's Huygens lander, an ESA probe, touched down on the enormous moon Titan and relayed the first photos ever from the surface of that intriguing world. Titan has a thick, nitrogen-dominated atmosphere and a weather system based on methane and ethane, which have pooled to form lakes in various places across the moon's surface.